Thermal Imaging measures energy radiated from the patient's tissues. Why consider a thermal imaging screening? What are the benefits of Digital Thermal Imaging ? 1. 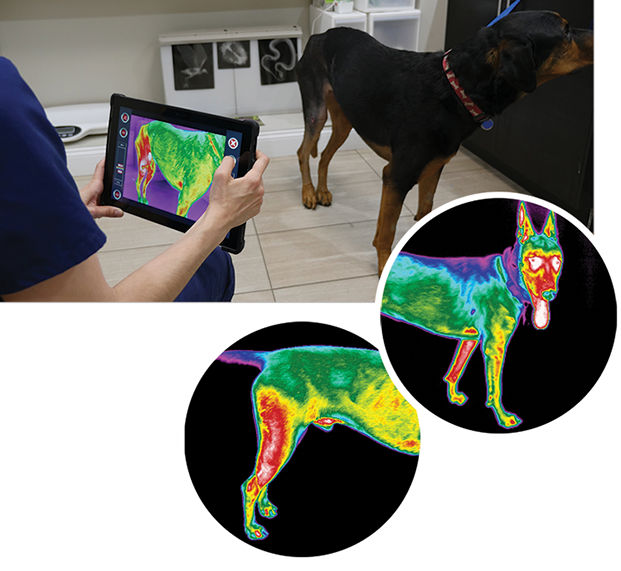 Thermal imaging is a tool that allows veterinarians to identify anatomical areas that may require further evaluation. 2. Thermal imaging also provides a visual evidence to support the physical exam. 3. Provides an objective measurement of the progress of any therapeutic protocol. 4. It is a visual image that helps aid in communication and education in therapy protocols. Initial presentation: In February 2018 Oreo's owner reported that pet was having some difficulty getting up for about a year. On examination, Oreo had decreased Range of Motion (ROM) on extension of both hips and mild muscle atrophy of both pelvic limbs. A presumptive diagnosis of osteoarthritis of both hips was made. Rehab recommendation: twice weekly underwater treadmill sessions and LASER over both hips. 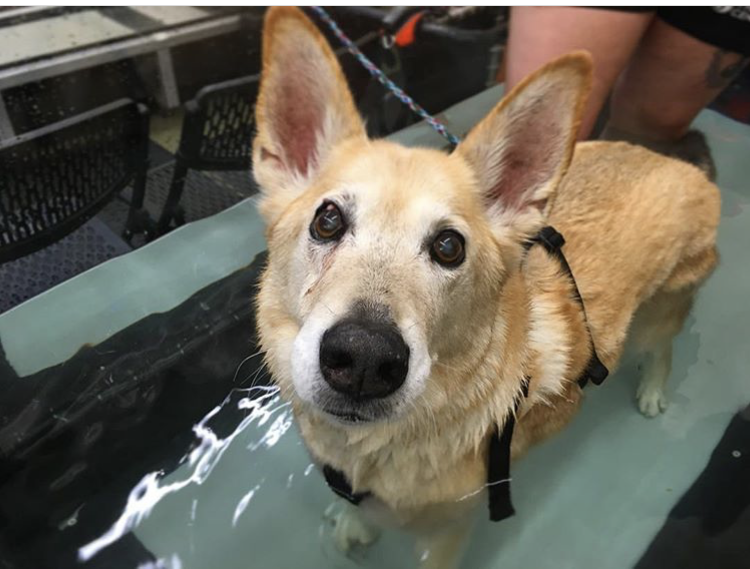 Rehab progress: Oreo came for weekly laser and underwater treadmill sessions, and did well but over the summer his owner and the therapists were noticing some stumbling over his forelimbs. On examination there was nothing remarkable to explain this but we did have his LASER frequency increased to twice weekly. 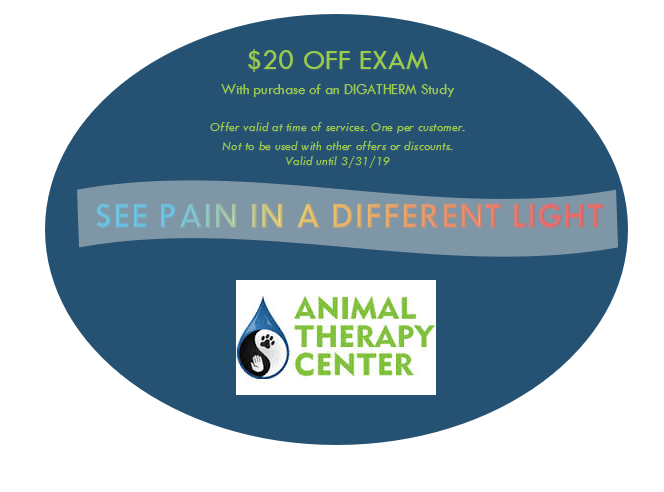 On November 12, 2018 an initial digatherm (thermal imaging ) study was performed. Oreo had some coldness noted over both hips and distal aspect of forelimbs with a focus cold spot on the right. On the gait analysis you could see he was off loading from right to left forelimb. Based on these results, a change in his therapy plan was made, and we continued with LASER over both hips and added in both elbows and C7-T2 to his LASER sessions. Oreo's owner over the first two weeks reported back that she had not noticed a lot of improvement initially but did note a bit less quivering over his forelimbs. At the 4 week post-image study she had reported that he is stumbling less over his forelimb than he was. 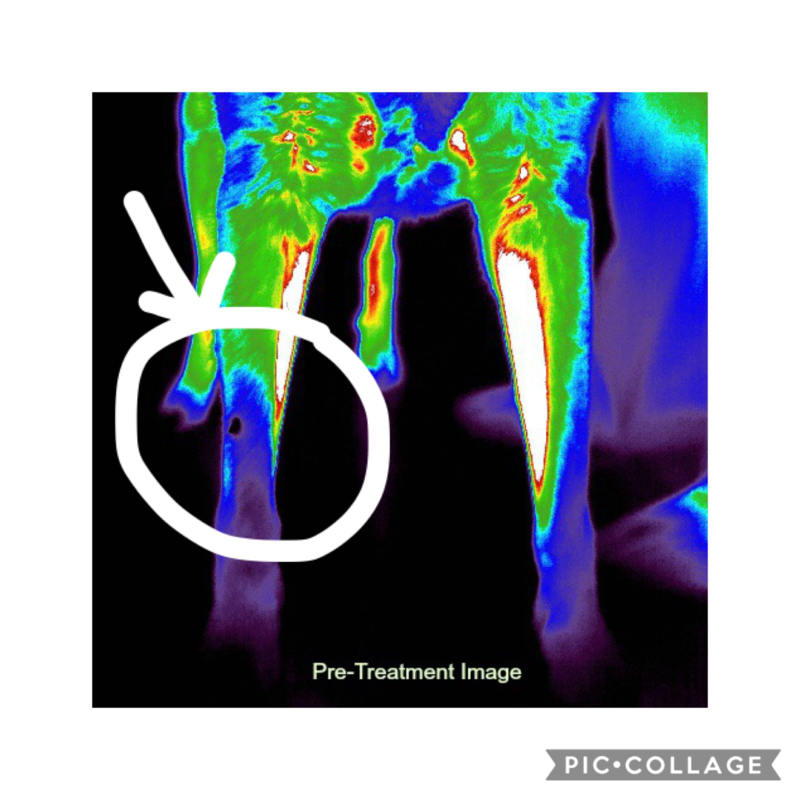 The post (follow-up images) showed that there seemed to be improved blood flow to the right forelimb and the focal cold spot had resolved. He appears to have less heat over his hocks and forelimbs and well as improvement over the cervical thoracic spine. 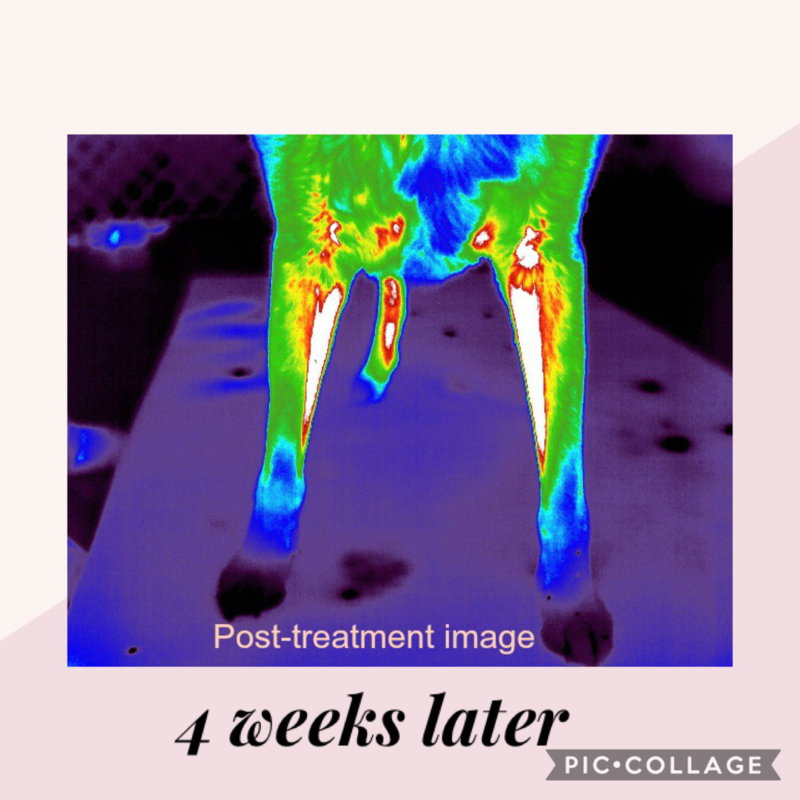 Additional notes: After the second Digatherm scan, he started to drop his pelvis and we added L7-S1 to his LASER sessions and owner reported additional improvement.